Here is my latest Britex project - I am rather pleased how this one came out! My goodness, the weather has been beautiful lately, and working on a new Spring frock was just what I needed to push me out of a minor creative funk. I was certainly glad to have the capelet handy when I took these pictures last week because there was a definite chill in the air. Between the lovely fabric and the fabulous dress design, I cannot really take much of the credit – both those elements really make the dress. I have had a couple of questions about working with the fabric, itself. 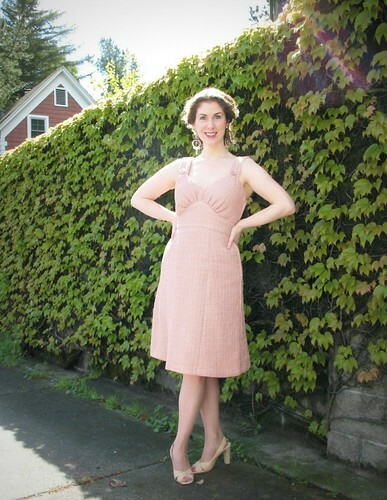 The linen blend is extremely ravely (as are most loose weave fabrics), but so worth the extra effort. I am always drawn to the novelty category because the choices are glorious, although they do present their own challenges. The blend is comprised of 66% linen/17% cotton/13% viscose/4% acrylic. Linen loves a good hot iron, as does cotton, but acrylic does not. After studying the weave, it became clear that the acrylic portion is woven into the top layer of the fabric every inch or so. This makes it easy to press from the wrong side of the fabric, but those synthetic bits had me worried about the right side. It is rather embarrassing to admit, but I am not great about using a press cloth. I have become much better about it over the years, but still get lazy about grabbing one most of the time. For this project, however, it was essential. My iron is a basic model, but I did not feel like picking melted bits of synthetic fabric off of the faceplate – and I certainly did not want to hurt the fabric! As far as dealing with the shredding edges, the best bet is to handle cut pieces as little as possible until they are stitched up and finished off (my favorite method is seam binding). Underlining with a denser weave linen/rayon blend also helped me out during construction - because the underlining did not fray as much, I still had a good idea where the original seam line was located, even when some of the fashion fabric was lost to the shred monster. And now I am definitely going to say farewell to the Winter wardrobe - pastels and bright colors, here I come! Absolutely stunning. The best Parfait I've seen, by far. And that caplet! Wow. What a great outfit! I adore that capelet, it's a detail I've seen a lot in vintage fashion illustrations but never on a real person. It looks great and I'm quite tempted to try and make one myself. 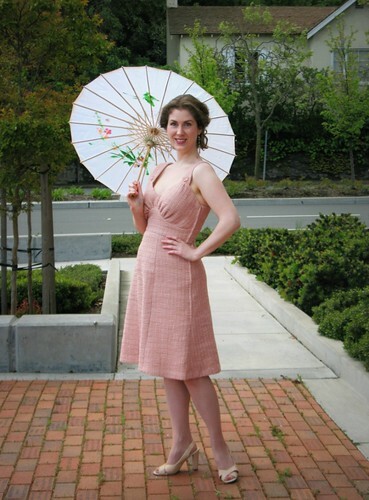 It would really help make a summer dress wearable for more than just a few weeks. P.S. Thank you for your comment on my Pattern Magic top. I definitely see your point about modern pattern stuff like this but when you see the designs in the Pattern Magic books as building blocks for your own designs, rather than as projects on their own, it's very well possible (for an experienced seamstress and pattern maker/manipulator) to use them to enrich any personal style. How lovely! The colour is so beautiful on you and the capelet really makes the outfit. Well done! So pretty!! The color of the fabric goes so well with your coloring, and the dress and cape couldn't be more darling. 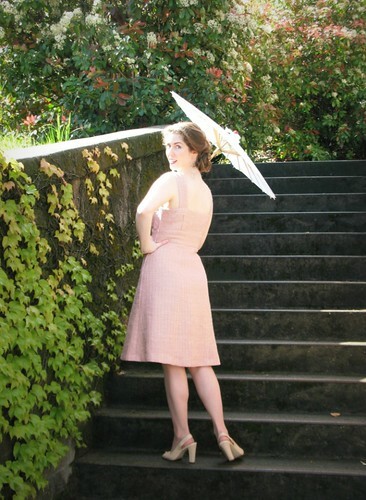 Very pretty and a perfect Spring dress.mwell made, love your photo collage. Oh my, what a gorgeous little outfit! I just love the capelet with it and how you've cleverly attached it to the dress! Very charming. The under bust gathering looks like a sunrise and the dress length is very flattering 'cause you got great gams. As always... you do marvelous work. I am in awe of your talent and your eye for detail. Absolutely love it! I love this, the two pieces made up a wonderful outfit. I'm particularly struck with the capelet - it is the perfect finishing touch. Wonderful outfit and so spring-like. The capelet is the perfect little something. Bravo. Fabulously beautiful! 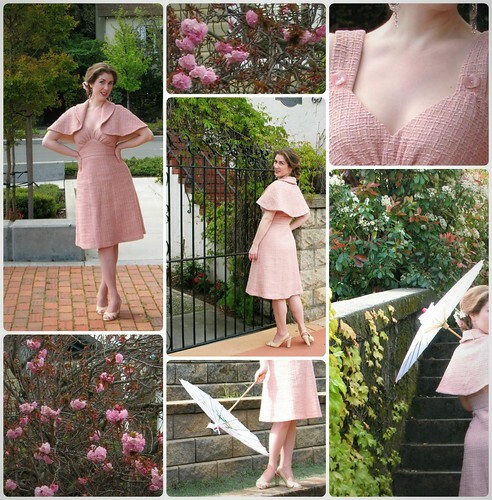 I love the number of photos you posted here, showing us this super pretty springtime ensemble from so many angles really makes it all the more memorable (for us readers, I mean). Amazing work, as always, dear gal! It is a stunning ensemble! OMG this is amazing! Just perfect for spring: the color, shape, everything is stunning!